Women are born with millions of eggs in their ovaries at birth, and this number declines with age. At 25, women’s monthly live birth rate starts to decline. 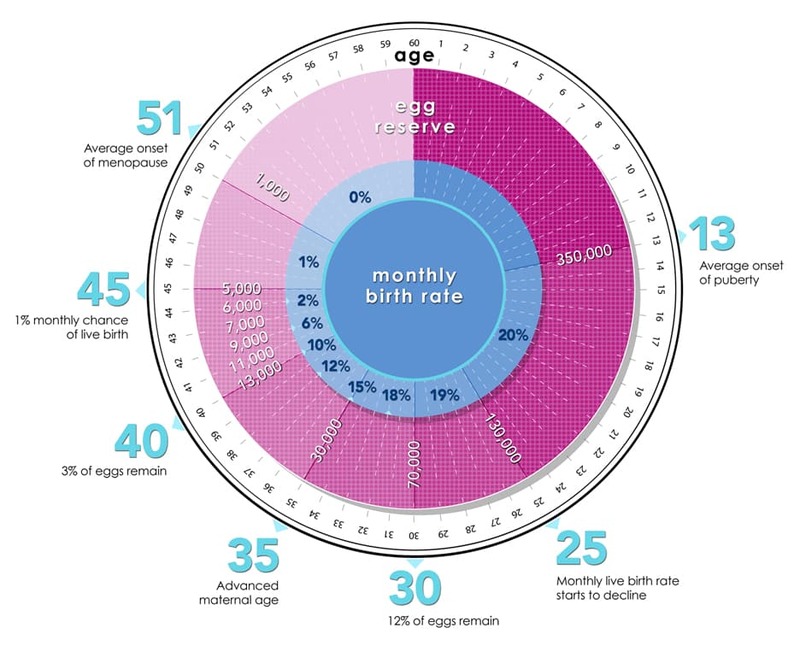 By age 30, 12% of eggs remain, and 35 is considered AMA (Advanced Maternal Age). By 40, on average 3% of a woman’s eggs remain, and by the age of 45, a woman has a 1% monthly chance of getting pregnant and giving birth. How can you know how many eggs you have, and what type of quality they are? Usually an ultrasound can see how many follicles (where the eggs begin to grow) are maturing (usually tested between cycle days 2-5). And a blood test can check AMH (anti-Müllerian hormone) which can give doctors some idea of how well one’s ovaries are functioning, but may not be a predictor of future fertility. Women on average have about 15-30 follicles in their 20’s, and that can go down to about 10 follicles. The get a fuller picture of one’s fertility, look at the mother’s health history. When did your mother enter menopause? Did she have trouble conceiving? This information can be helpful, especially in conjunction with fertility tests. No matter what the genetics, blood-work, ultrasounds and health history look like, one thing goes for everyone considering having children (both women and men) – preconception care. Folliculogenesis, the maturation of ovarian follicles which leads to creating a dominant egg for ovulation, takes place over months, and how much that can be influenced is still unknown. Many fertility doctors, gynecologists and fertility health care providers recommend taking a few months to get in fertile shape, cutting toxins or bad habits out of your life, and incorporating foods and exercises that can reduce stress and enhance fertility. If you have any questions about fertility testing or how to prepare for conception or IVF, call our clinic anytime – we are always happy to help you on your path to pregnancy!